And there’s more from Audio Damage. 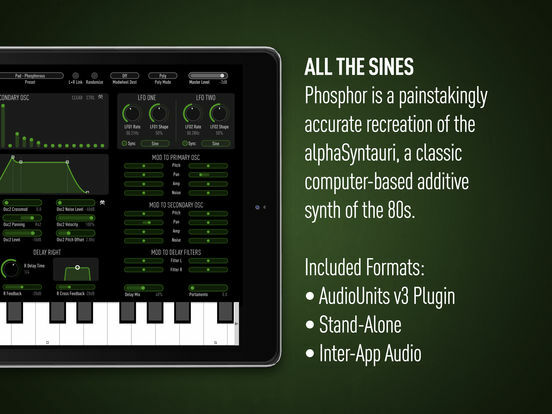 Phosphor is an unique instrument that is modelled on the alphaSyntauri, a vintage digital additive synth from the early 80s. 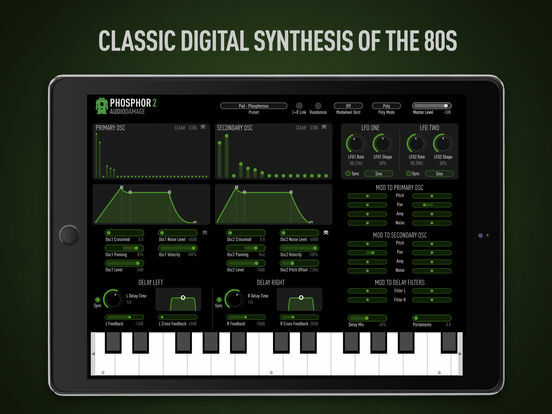 The original alphaSyntauri required an Apple //e to operate, but Audio Damage have gone ahead and cut out the middle-man, and now you can own this classic digital synth in your iOS device, at least on your iPad for now anyway. Phosphor features two additive oscillators (with the original 16 partial complement of the alphaSyntauri, or optionally with 32 or 64 partials), each with its own amplitude envelope. 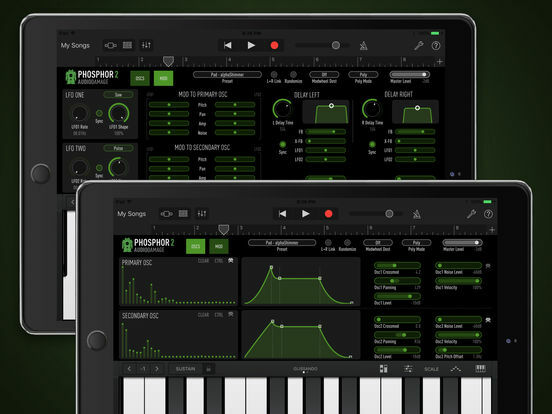 Phosphor’s topology closely follows the alphaSyntauri, while adding many modern features such as full velocity control, a much more extensive modulation routing system, tempo synced LFOs, a pair of delays, and two monophonic modes. The noise and oscillators are able to work in the original alphaSyntauri “low-resolution” modes, or can be run in modern high-resolutions. Phosphor can accurately model the original sounds of the alphaSyntauri, yet still provide new paths for sonic exploration. Two complete oscillator/envelope sections modeled on the original topology of the alphaSyntauri. Each set of partials can run in “lo-fi” mode, emulating the gritty digital voicing of original, or in a modern mode for alias-free sines. The noise can be either “lo-fi” digital shift-register noise per the original, or modern white noise. XML preset system, with copy-to-clipboard, for sharing presets in forums and with your friends. AudioUnits V3 version for use in all AUv3 hosts, like AudioBus 3, AUM, BeatMaker 3, Cubasis 2, GarageBand, etc. Standalone version (with full single-panel UI) with Inter-App Audio and BlueTooth MIDI capability.